Government's assets acquired in the financial sector bailout are worth less than what they initially paid for them, according to an oversight official. NEW YORK (CNNMoney.com) -- The Treasury Department overpaid for the assets it purchased as part of the $700 billion financial sector bailout, according to testimony of a bailout oversight official before Congress on Thursday. At a Senate Banking Committee hearing, Elizabeth Warren, head of the Congressional Oversight Panel, testified that the more than $254 billion in assets that the government purchased in 2008 are worth just $176 billion - $78 billion less than what Treasury paid for them. Warren said the shortfall happened on the date of the transaction, and is not representative of the market's movements since then. She noted that Treasury has failed to delineate a clear reason for such an overpayment. "At various points Treasury has articulated policy objectives which could result in a program involved in paying substantially more for investments than they appear to have been worth at the time of the transaction," said Warren. "The American people want to know what's going on and they deserve answers." Warren's panel will release its full report on the shortfall Friday. She said the panel arrived at the figures after it hired an independent valuation firm and finance experts to analyze publicly available data on the banks receiving bailout funds. The study follows a separate report released last month, in which the Congressional Budget Office estimated that the Treasury has lost $64 billion on its investments in the Troubled Asset Relief Program. But Warren said the experts hired by her panel valued each transaction using multiple methods, and arrived at the conclusion that the CBO's estimates were too low. Warren said Treasury failed to price in risk for its capital purchase program, buying assets that would likely decrease in value. "It's as if I said I'd pay $1 million for 10 paintings, but one was a Picasso, one was a Rembrandt and the others were not," Warren argued. The committee heard from the heads of the three key TARP oversight bodies: Warren; Neil Barofsky, special inspector general; and Gene Dodaro, acting comptroller general of the Government Accountability Office. All three said Treasury needs to implement a more transparent asset management strategy to ensure that taxpayer dollars are not wasted. "They need to ... articulate a clear strategy, otherwise they are spending billions of dollars on an ad hoc basis," said Warren. Committee members and oversight officials expressed concern that banks in receipt of bailout funds are not required to account for how they use the money. Lawmakers especially expressed outrage regarding bailed-out banks' purchases of planes and luxury hotel rooms. "Too many banks are given a free pass; too many TARP recipients use these funds for everything but lending," said Sen. Christopher Dodd, D-Conn., committee chairman. "The public is outraged by this behavior with good cause." Barofsky recommended Treasury address the public's concerns in a report that he submitted to Congress on Thursday. The report said Treasury must tighten regulation of the bailout and implement a better investment strategy and new fraud prevention standards. In testimony, Barofsky said Treasury must make known "what the recipients have done with the hundreds of billions of dollars that have been invested." So far, the Treasury has injected into 360 banks more than $195 billion of the $250 billion allocated for capital injections. It has also sent another $20 billion each to Citigroup (C, Fortune 500) and Bank of America (BAC, Fortune 500) in emergency funding, $40 billion to American International Group (AIG, Fortune 500),and $21 billion to General Motors (GM, Fortune 500), Chrysler and GMAC. In exchange, Treasury has collected preferred shares or warrants, and amassed a large portfolio of investments. Dodd and ranking member Sen. Richard Shelby, R-Ala., both said they were worried that Treasury did not have a coherent and consistent plan. Treasury, before the bill was passed, told Congress that it would buy up toxic mortgage-backed securities from banks' asset portfolios. Soon after the bailout bill was enacted, Treasury said it would instead inject capital into healthy banks, but few would argue that all the banks receiving funds qualify as "healthy." Shelby asked Warren if she felt Treasury had purposefully misled Congress. "It suggests the Secretary's [Paulson's] description of the program was not entirely candid," Warren responded. "They did not do what they said they were doing. They announced one program and implemented another." Many lawmakers voted to halt the release of the second half of the bailout funds, though the motion eventually failed and Treasury received the second $350 billion. 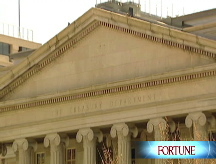 Treasury Secretary Tim Geithner and President Obama hinted that they may detail a revised bank bailout as soon as this week. The plans are likely to include a program that would relieve banks of troubled mortgage assets, and may also feature promises for additional capital infusions or an offer to guarantee the value of some bank holdings. The oversight group representatives said they had met with Geithner and were encouraged by early indications that the new secretary would take up many of the recommendations they had made to the previous administration.